I have been a devout motocross/supercross fan for many years. I have attended countless Outdoor National races, and stadium Supercross events. One race stands out in my mind when I think about the greatest, single performance I have seen from a rider. After a lackluster Supercross season in 1999, no one could be sure how fast Sebastien Tortelli would be outdoors. Sure, he had taken Stefan Everts’ 250 World Championship from him in 1998, but the professional motocross riders in the United States were fast, and the AMA 250 field was deep with talent. 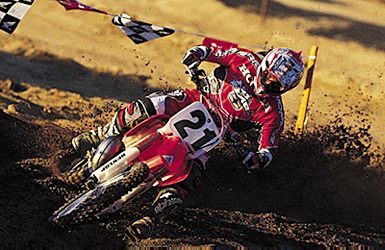 The first AMA Outdoor National of 1999 was held at Glen Helen Raceway in San Bernardino, California. It was Sebastien Tortelli’s first Outdoor National motocross race in the United States. He simply blew everyone away. Tortelli was so much faster than the rest of the field that day, he was literally in a league of his own. Poor starts in both motos didn’t stop him from blitzing to the front and, in the process, passing some very fast riders with ease. I remember asking myself whether Tortelli, like his countryman Jean-Michel Bayle, would eventually master Supercross. His talent outdoors is so huge, and his mental attitude and work ethic so right, I envisioned him someday winning Supercross races almost as easily as he won that day at Glen Helen. Tortelli isn’t there, yet. He isn’t dominating Supercross, and he hasn’t even won his first Supercross race (leaving out the mud bog event held in Los Angeles several years ago — a race Tortelli did win). He is, however, showing the steady improvement I expected, and has been the fastest rider on a Supercross track at times this year. His ride in Pontiac, Michigan, two weeks ago was a breakthrough of sorts. If Kevin Windham had been taking for granted the fact that he is the fastest, healthy Team Honda Supercross rider, he isn’t any longer. How good will Tortelli get at Supercross? Obviously, I don’t know for sure, but nothing will surprise me. There is something about his approach to this sport that makes me think he will ultimately be a very special Supercross talent — just as he is already a special outdoor talent. As Jeremy McGrath continues to dominate Supercross, we often wonder who the first true, consistent challenger to McGrath will be. Maybe it will be Sebastien Tortelli.